New Kest KST1602B-W White/Blue Alphanumeric 16x2 LCD Display. NOS Ampire AC-202A LCD Display Module, Guaranteed. 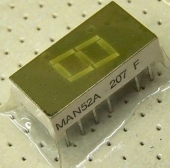 New Fairchild MAN 4610 7-Segment 11-Pin Display. New HP 5082-7650 Red 7-Segment Numeric Display w/Decimal Point. Lot of FOUR NOS TIL314 / MAN52A 7 Segment Displays. .300 green displays with common anode connection. New LA301VL 7 Segment Display For Otari Recorders.